All over the world, millions of mothers, fathers and grandparents get their children to sleep by the pacifying ritual of singing and rocking the infant or toddler. “Slaap, kindje slap”, for example, is sung in the Netherlands, “Baju, bajuschki, baju” in Russia, and “Thula baba” in South Africa. 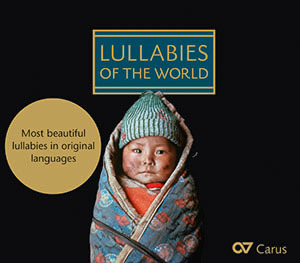 Singers and instrumentalists from all over the world have recorded the most beautiful lullabies from their home countries exclusively for this CD collection. The accompaniment by tradition instruments highlights the original sound of these songs. The CD contains lullabies from Armenia, Belgium, China, Germany, Finland, France, Greece, India, Italy, Japan, Korea, Latvia, Lebanon, New Zealand, North America, Norway, Portugal, Russia, Spain, South Africa, the Czech Republic, Turkey, Hungary and a lullaby in Yiddish. With this recording the prize-winning “Liederprojekt”, promoting singing with children, is being continued and expanded by an international collection.